I’m a very skeptical person, but I’ll always reevaluate my position in the face of new evidence. When I first started working with paid search channels, I didn’t believe that anyone really clicked on a search advertisements, then I saw the clicks and conversions. I started working with banner advertising in the Display Network and never thought that it could actually bring a customer in, but then I saw the abandoned shopping carts turn into revenue with the use of Google’s remarketing targeting. My experience with Bing Ads had always been negative, regardless of the product or service I was advertising. Broad match might as well be random match. Even phrase and exact match didn’t seem to be focused on my keyword strategy. Budget, in Bing, was a four letter word. Google always advised of the possible 20% budget overage, but the overspend never seemed that severe and it was never Bing’s 100% or more overages. It’s hard to consider Bing Ads a viable channel if the best case scenario was reaching a mere 20% of the search market. Perhaps the most annoying aspect was the user interface. Even if your account was perfect in design, it could all be undone with a single click in the poorly compiled Bing Ads Editor. WIth so many wrongs, it may seem impossible to add up to a right. 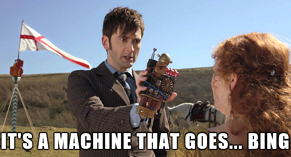 Why spend a dollar with Bing when you could make that dollar matter in Google AdWords? Who uses Bing for anything other than late night searches? That used to be me. Now, I make sure there’s a few bucks left in the budget for Bing. Here’s why. Bing Ads, Google AdWords’ younger sibling, is trying really hard to be like its older, more accomplished kin. That means, other than some trademarked intellectual property, Bing is implementing much of what Google’s interface successfully accomplishes. Marvel at Bing’s new sitelink and call extensions, and enjoy Bing’s auto-tagging for Google Analytics compatibility. The Bing Ads interface, like my awkward teenage years, got better! If it has been more than a year since you last tried the editor, you should give it another download. The days of holding a click one microsecond too long and inadvertently dragging and dropping a campaign seem to be gone. These days, new PCs often come with a Bing default search engine and Microsoft related homepage. While savvy users will often change their defaults to Google, there are many users that will not. These not-quite-as-savvy users are unlikely to see your hard working Google AdWords campaigns. 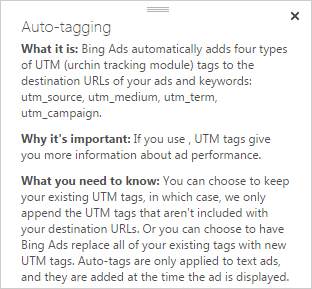 Advertising in Bing will get your ads seen by this potentially valuable user group. Smaller search market share is good in the case of Bing Ads, because a smaller market will mean less competition. 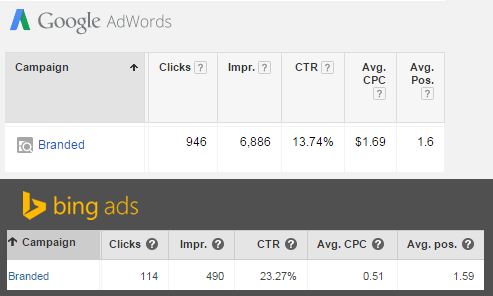 For the most part, a campaign in Bing Ads will bring less overall traffic than AdWords. The traffic, however, will usually come at a lower cost per click and have a higher click through rate. Here’s a look at one of my brand campaigns running in Google and Bing. Bing may be fewer overall clicks, but they’re affordable and clicking at a noticeably higher rate than Google. The phrase “low hanging fruit” is thrown around often these days to describe low effort wins, but I’m not going to use it to describe Bing. Bing paid search is even easier than that: it’s the fruit on the ground. If you’ve tried Bing Ads in the past, or if you’ve never used Bing Ads before, you will definitely want to import your existing AdWords campaign into Bing today.